MARBLE INLAY ITEMS -Manufacturer,Exporter, Wholesaler and retailer of table tops,plates,boxes,tiles,in Agra,India. MARBLE INLAY also known as "Pachchikari" or "Parchinkari", "Pietra dura" or "Pietre dure" is the same art work which has been used on the walls and tombs of TAJ MAHAL built by the Mughal Emperor Shahjahan in Agra (India) in the 17th century and also in other Mughal monuments of Agra such as Agra fort, Itmatuddaula's tomb. It can also be seen in Palaces in Delhi fort also built by Shah Jahan.Semi-precious stones such as Lapis lazuli, Onyx, jasper, cornelian have been combined with marble of various hues to create designs of unsurpassed elegance.Mughal Inlay art is a remarkable feature of Mughal architecture in India and Inlay art was an instrument of dynamic expression in the great age of the Mughal Empire and ShahJahan was the chief patron of this work as he used the finest inlay work in TAJ MAHAL. In this art, also known as Pietra Dura inlay, beautiful floral and geometric patterns are created using various natural semi-precious stones LAPISLAZULI (Afghanistan), MALACHITE (South Africa), TURQUOISE (Iran), CORAL (Italy), CORNELIAN (India),PAUA SHELL (New Zealand), Amethyst and many other stones such as Jade,Jasper.Agate etc. 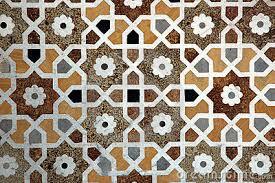 Then these stones are inlaid in white Indian marble known as MAKRANA MARBLE (used for building the Taj Mahal and which was brought from Makrana in Rajasthan,India and today also it comes from the same place. ), black marble, green marble (Baroda green) etc. White Indian makrana marble is considered to be one of the best in the world and is mainly used by us for making the inlay items. We also use Italian marble like Crema, Botticino mainly for the table tops. We have carried forward this magnificent Art through our family artisans and have set high standards. We make designs from the Taj Mahal as well as create our own intricate designs and make designs according to order. We are known for quality and designs in Agra as many exclusive and unique designs are made by our family craftsmen. In the past we have replicated many designs from the Taj Mahal for our customers. This art has survived in Agra because of Taj Mahal. 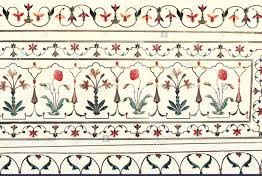 Tourist who visit Taj Mahal are fascinated by its inlay work, and like to see how this work is done in a factory and buy marble inlay handicraft items. We use inlay work in making beautiful WHITE TABLE TOPS.​ Other color of marble we use for making inlay table tops is BLACK, GREEN, pink and yellow.The material used for white table tops is mainly Indian white makrana marble of which Taj Mahal is made.For Black table tops we use black Cuddapa, for green- Baroda green and for yellow we use Jaisalmer stone. Makrana marble also comes in pink color. These marble inlay table tops are used as DINING TABLE TOPS , coffee table, side table. Marble inlay table tops come in different shapes--rectangular, octagonal, square and oval. We have made many Pietra dura ITALIAN design table tops in black marble in the past which can be seen in our black table tops section. We also make BASES with inlay for the table tops which usually are of the same shape and color as the table top and come with or without an inlay pattern. If we use the inlay pattern then the design will normally have the same flowers and color combination but differs in the pattern from the table top as the design is adjusted for vericality and when the table top is placed on the base they make a beautiful set. We have made many bases for the table tops which can be seen alongwith the table tops and also in our bases section. Plates, Boxes, Trays, Coasters, Coaster sets, tiles, Chessboards, Backgammon boards, photo frames, Taj models, pen holders, card holders, ashtrays, paper weights,flower vase, pots, cups, glass, elephants, wall panels, wood inlay and any other item required by our clients in inlay or in stone. Marble inlay wall and floor tiles and medallions are in high demand nowadays. We have made lot of bathroom tiles, border tiles, floor tiles, floor medallions for our Indian as well as foreign customers. Besides the table tops which we make in different colors the other marble inlay items are also made in different marble or stones. All the marble inlay items are very popular mainly because of their aesthetic beauty and durability. They are very good for gift also. People buy them as corporate gifts, wedding gifts. Color combination:- There are various options of color combinations for our inlay items. You will see some items in predominantly one color for eg in Lapislazuli(blue) or in Malachite (green) or in Carnelian (orange),some in two color combinations while others in multi-color combinations. Any particular design can be made in other color combinations. So if you like any design on our website but want in different color combination and size it can be done by us on order. For eg a design in blue can be made in green or orange or in multi-colors or in two color combinations. You will find on our website that in some cases same design has been made in different color combinations.For various options of color combinations please see here. We are exporting to Europe,USA and other parts of the world. We have many satisfied customers (testimonials)​ in EUROPE, USA, and other parts of the world who have bought from us online and have repeated orders and are satisfied with our job.We can provide you their e-mail, phone nos for you to contact them for your satisfaction. We have a factory where many new designs are made continuously by our family and other master craftsmen. The visitors are welcome to see the process of pietra-dura inlay which is very interesting for them. Prices-The prices of these marble inlay items depends on mainly these 3 factors 1. Amount of work 2.Nature of workmanship 3.Types of stones used. Browse our products with prices and shipping cost and buy online marble inlay table tops,plates,boxes and other marble inlay items. SHIPPING--------of items upto 35-40 kg is done by courier-DHL,FEDEX,UPS and are home delivered in 7-8 days.Items over 40 kgs are shipped by sea--ocean freight (costs less) and are delivered to year nearest sea port. Facilities are also provided for home delivery by sea on payment of extra charges which depends on the destination.Before shipping we insure the items to cover all the risks.You can know the shipping cost on our website by clicking item of your choice and then clicking the shipping option. Compare our price and quality which you can easily do online nowadays. We accept payment by PayPal and also by wire transfer. it will have to be made and this will take time depending on the size and work in that item. Please keep this in mind when placing an order. If you happen to be in Agra and want to visit our factory then we are just a call away. You can call us at the numbers given below. We will pick you from the hotel or other spot. We are very close to the Taj Mahal.